We entertain inquiries majorly from Gujarat. Highmast designing or specifying a mast system requires careful consideration of the required aesthetics, available access and the area the mast is to be located. 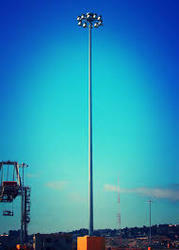 We specialize in offering High Mast Lightning Services to our clients. These are highly demanded by the customers due to their cost-effectiveness, reliability and timely execution. 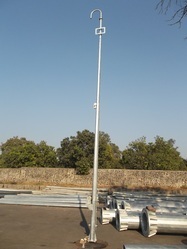 We offer our clients with High Mast Lightning through high mast for public places, parking area, gardens, road and highways, sports complex, parks, housing and commercial complex and industrial corporate offices. 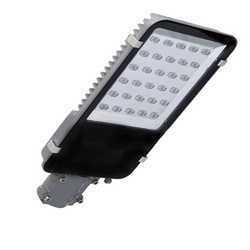 With our vast industry experience and keeping track of latest in market trend we present our clients exclusive range of LED Street Light. 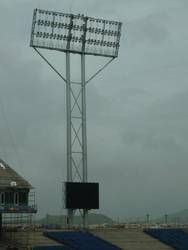 stadium lighting mast are designed with fixed head frame for mounting a large concentration of sports lighting luminaries. The height of teh mast and the number of flood lights are based on the lighting design, our structural design team has wide experience in designing such masts. stadiu lighting masts are custom designed based on the lighting design and available site constraints. Designed by our structural team care fully as per satndards. Automated fabrication,automatic SAW Welding with no Deformity in the structure. No Joints up to 14m Length. Hot dip galvanized- no periodical repainting is required. No extrenal Junction boxes are required,electrical accessories are housed inside the pole. Easy relocation in comparison to grouted poles. Flexibility of mounting designer brackets & Luminaires. 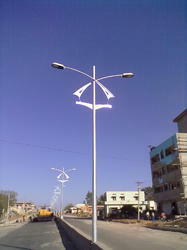 Highmast Lighting Systems are reliable, efficient and maintenance friendly system area lighting. Railway's circulating area & station area lighting. City junction & flyover lighting etc..
Power plants/ other Large Engineering Plants etc. Looking for Lighting & Luminaries ?